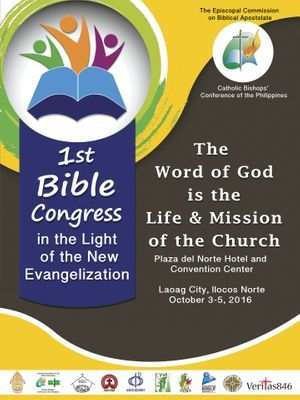 To maximize the implementation of all of the statements made in Koronadal City (formerly Marbel) after the 21st National Bible Workshop, we found it helpful to come up with a Bible Congress which aims 1) to deepen the awareness of everyone involved in the different commissions of the CBCP, including the Bible Apostolate on the importance of the Word of God in the mission and vision of the Church as found in Verbum Domini, 2) to provide a venue for updating on current studies on the Bible 3) to motivate the participants to appreciate the Word of God and be actively involved in its use and reflection in their respective ministries and commissions and also in the distribution of bibles to all parishes and dioceses. Digital files of the Presentations in the 1st National Bible Congress. Descriptions are given for each file. Just click on the link to download file. Some of the files are large and may take some time to download.